Women's Clubs Are Asked to Establish Free Scholarships for Education of the Poor. "For the children of the widows, I demand that each woman's club in Chicago establish one or more scholarships that shall be as dignified as the University of Chicago scholarships, to enable as many children of the factories to attend school as the women of Chicago can afford to educate." 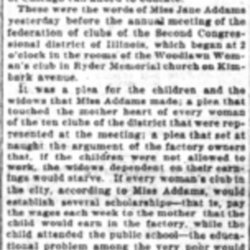 These were the words of Miss Jane Addams yesterday before the annual meeting of the federation of clubs of the Second Congressional district of Illinois, which began at 2 o'clock in the rooms of the Woodlawn Woman's club in Ryder Memorial church on Kimbark avenue. It was a plea for the children and the widows that Miss Addams made; a plea that touched the mother heart of every woman of the ten clubs of the district that were represented at the meeting; a plea that set at naught the argument of the factory owners that, if the children were not allowed to work, the widows dependent on their earnings would starve. If every woman's club in the city, according to Miss Addams, would establish several scholarships -- that is, pay the wages each week to the mother that the child would earn in the factory, while the child attended the public school -- the educational problem among the very poor would soon be solved. It was education and the child-labor bill that occupied the time of most of the speakers. Miss Addams further stated that the labor problem was the problem of the age, and one which the women's clubs could not ignore, and only through the children of the present generation could they effect a change. It was the children who would control the situation in another ten years, and by educating those children Miss Addams hoped to see the dawn of a new era for the laboring classes of America. The establishment of scholarships for the children of widows, Miss Addams stated, was an everyday occurrence in Switzerland, and was done by the government. Yet in Chicago, she said, it was necessary to call upon the women's clubs. It was the largest meeting of the year for the clubs, and all of the prominent members of the clubs of the South Side were in attendance. There were no dry eyes when the speaking was finished, and the business of the federation began. Plea is Made for the Widow's Child, The Inter Ocean (Chicago), September 30, 1903, 5. Addams, Jane, “Address to Second Congressional District of Illinois, September 29, 1903,” Jane Addams Digital Edition, accessed April 25, 2019, https://digital.janeaddams.ramapo.edu/items/show/6726.